The pillows are very comfortable and provide a good night's rest. They are firm without being hard. I will buy these again when I need more pillows. Upgrade your sleep with this decadent set of down alternative pillows. 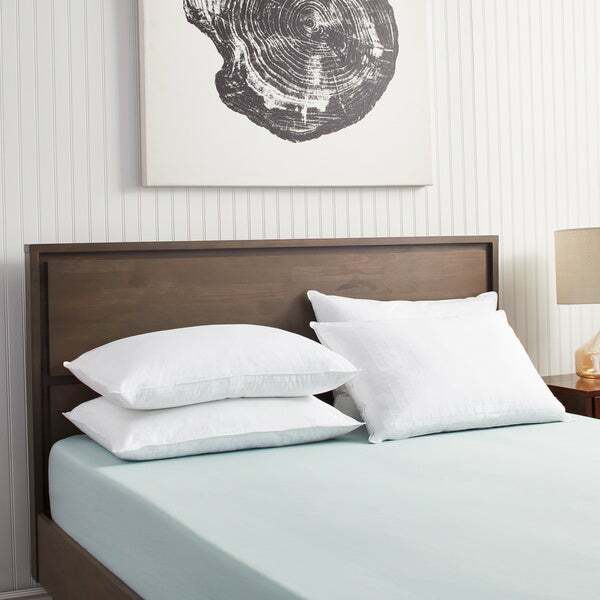 The four included pillows have soft, 100-percent cotton covers for a fresh feel on the skin and are filled with a warm and plush down alternative to support your head while you drift off to sleep. These pillows are available in soft, medium, firm, or extra firm options. I purchased a set of medium and a set of soft king and updated the bed in my house and at a furnished rental. I am pretty picky about pillows (says my husband), and I loved both sets. I put two med & two soft on our bed and really noticed a difference. The soft are not nearly as soft as you would see in a $100/pillow soft down. If you are looking for the type of soft that you can fold twice or smoosh into a small ball, these are not for you. I have one of those and I couldn't bear to give it to goodwill with the rest of my pillows, but in the month that I've had these, I've not used the old, worn, beloved down pillow even once. These overstock pillows were good to go right out of the box - no need to air them out - no funny smells. They are very puffy when sitting on the bed, but they smoosh down nicely when you lay your head on them. I sleep a combination of side & back. Both firmness levels are great, but I have developed a preference for the soft one. It tucks nicely under my neck while still supporting my head when lying on my back and allowing a comfortable neutral spine. Absolutely zero problems with either of these pillows and I usually reject new pillows within one-two nights. First, let me say that I had to try three different firmness levels of these pillows to get "dialed in" to the right ones for me. Fortunately I was able to return the pillows that were uncomfortable for a refund (minus the shipping costs). I have used down pillows in the past, but none seemed quite firm enough for me. As a stomach sleeper I found the "Firm" down alternative pillows too unforgiving, even after reading other reviews that said the firm pillows were too soft. After realizing the firm pillows were WAY too firm for my liking, I went the total opposite direction and tried the "Soft" pillows. Initially I thought these would work well, but I quickly found my head was in a "hole" with no padding under it. There just didn't seem to be enough filling in the pillow to actually cushion my head when I slept. Finally, I tried the "Medium" fill pillow. WE HAVE A WINNER! This firmness was soft enough to accomodate my sleeping position, yet provided enough fill material I did not feel like my head was unupported. With four pillows I can have the same pillows in my motorhome as I do on my bed at home. The only thing I would like to see is an option of ordering two different firmness levels so people who like different types of pillows might be accomodated. Other than that, the quality of the pillows is excellent and I look forward to years of comfort. Unlike what was mentioned in a few other reviews, I noticed no unusual smells with these new pillows. The pillows are squishy - I don't know how else to describe them. I ordered the firm , but they are not like other firm pillows that I have. It works well for us, but if you want a truly firm pillow (rock hard), do not get this. I think because they are "down alternative," they are intended to feel more like a down pillow would. So if that is what you are looking for, these are perfect. The firm pillows are pretty full so even if your head sinks in a bit, it doesn't become completely flattened like a real down pillow would. These are good pillows, but you just need to be aware of what you are buying. If you're a definite side sleeper, I recommend firm or extra firm - these are the most wonderful heavenly pillows of softness and comfort ever. I roll around from my side to my back, so the amount of softness and support in the mediums were perfect for me. All the reviews about how lovely these are - completely correct. :) I love these pillows. Cotton-covered pillows are very well made and sturdy. I purchased the firm and they are firm, but, able to be plumped up or down. My husband likes feather pillows, but I'm allergic, so this has been a great alternative! Have bought several sets to use in all of my bedrooms. Highly recommend! These pillows are very soft and comfortable. The medium fill is pretty soft, though, so if you really want medium I would go up one level of firmness. They are a nice option if you want the softness of down without feathers sticking out all over the place! These are the greatest pillows I ever slept on. I have bought pillows for $60.00 a piece that did not feel this good. At this price it is almost like I got two free pillows. They cradle to my head so well that I would have thought you made these specifically for me. I like the four pack too because now I have great pillows all over my house. I plan to get more and I am going to tell all my friends about these. I love these pillows. I purchased the soft jumbos and they are great. I hope they last that will be the test. Per the other reviews I ordered soft! So glad I did because these pillows are very plush, still perfect support with any position however the soft feels more medium so the medium without a doubt would have felt firm/extra firm! I bought these solely based on the positive reviews here and could not be happier with my purchase. I bought the firm. Anything less than firm would have been too mushy. To me the firm is closer to medium in another pillow type. Glad I did not get the medium because that would have been closer to a soft. I do not think I will ever buy anything else but these pillows in the future. I have mixed feelings about these pillows...mostly good, but some disappointment too. I've had them for quite a while--probably 2 years--and am just now ready to toss them. I have thrown them in the washer MANY times (more than 10), dried them in the dryer or on the clothesline, and it's now, after so long and so many washes, they're starting to be clumpy, squishy (not in a good way) and impossible to find a comfortable position on. That said... These are probably the best pillows I have ever--or will ever--own. My only complaint is that they don't last forever! I have 2 king size and 2 queen size as well as 3 Euro pillows. All are terrific. You won't be sorry, I think! Las Vegas, Excaliber, the pullows were the best I had ever laid my head in. Viola! I found their secret out and bought my own. Perfect, mold to your head and shoulders... I got my four. So comfortable and soft. i could sleep on this all day and night. we have a king bed with double mattresses on it it they fit tight and snug. i recommend to all. These are hands down the best pillows I have ever purchased! They are soft and comfortable to sleep on and are still fluffy after four months of use. These are great pillows. Soft and yet structured. I recommend them and would buy them again. Nice size- just as described. No complaints. These are the best pillows I’ve ever slept on!!! I’ve tried My Pillow, both firmnesses, and they do not compare to these! They are supportive without breaking your neck, and so soft. I have recommended these pillows to family and they all agree. I highly recommend giving the wonderful pillows a try! Great pillows at a great price. We were looking for 4 new pillows for our master bedroom and this was a deal that could not be beat. Thank you Overstock! Not crazy about these for sleeping on as they are very soft but great for stuffing my king size decorative pillow cases for my bed, I would recommend for decor but not a good nights sleep. bought them for my son and his wife - they go through pillows so quickly - no idea why - they are happy with these and hopefully they will last them a while. These are very good Pillows. I Needed them for my weekend home and they are very comfortable. No problems. I would order again. Great value for 4 pillows. "I want to buy 12964772 set o4 want to buy now. Can I check out?" Hello suebee, checkout is available 24/7. You can order when ready. Thanks for shopping with us! The ratings were very high on these pillows. I have purchased these before and love them. Outstanding quality at a great price. "Do you have a recommendation for firmness?" Hello cherl, you would choose the firmness in the drop down tab. Have a great day! "is the jumbo the queen size"
Yes, it is the closest to the standard Queen size which is 20 in × 30 in and the dimensions of the Jumbo size are 20 inches wide x 28 inches long. The size is in between the standard size and queen size. Thank you for your inquiry. "are the materials imported or from the usa/canada/europe?" "Would like to order these in medium king - any plans to restock?" Since we are an online retailer, any of our products may sell out at any given time and we are not able to tell when or if they will be back in stock. It will be a matter of checking back, and the prices may also vary by the time they are back.